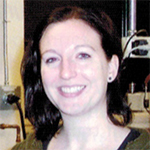 Katie Brown received her Ph.D. in 2012 working with CDAC Academic Partner Dana Dlott at the University of Illinois. She focused on the development of a technique to measure the global and local environments of inhomogeneous materials shocked with laser-driven flyer plates. Katie became interested in high pressure research while collaborating with researchers at Carnegie in an effort to combine surface-enhanced Raman spectroscopy with diamond anvil cell methods. In this work, she obtained the first spectra of molecular monolayers under high pressure. Following her graduate work, Katie went to Los Alamos National Laboratory as an Agnew National Security Postdoctoral Fellow. At LANL, she used coherent anti-Stokes Raman (CARS) scattering and CARS imaging to study the chemical and spatial evolution of reactions taking place in shocked inhomogeneous energetic materials. Katie credits her time as a CDAC graduate student with providing many opportunities to present her work at SSAP symposia and also at CDAC workshops. Particularly valuable was the chance to meet and discuss her research with NNSA Laboratory staff, which ultimately led her to the postdoctoral position at LANL. Currently, Katie is working on several projects as an early career LANL staff scientist, working for the Shock and Detonation Physics and Detonator Technology groups. One of her projects is laser initiation of novel energetic materials in a collaboration with inorganic synthetic chemists for the Joint DoD/DOE Munitions Program. She is also working on a new Laboratory-Directed Research project involving ultrafast spectroscopy of shocked energetic materials.